"Defense is boring" is something we hear all too often. There is nothing boring about quickly adding a couple hundred rating points without having to play any harder! Typical club players may think that playing defense is boring while stronger players know better. Strong players know that, when played properly, there is no faster, easier or more efficient way to achieve consistent RESULTS in your games! But how do you do it the right way? How do you spot the moment when you need to start defending? How do you use all your resources including the ones most players don't know even existed? What is a fortress and how do you construct one to maximize your fighting chance? How do you effectively sacrifice material to get promising passers and recognize stalemate ideas? How do you surprise and annoy your opponent with unexpected complications? What is the prophylaxis theory and why is it better to invest time into it than to defend? These are just some of the questions that every chess player must be able to answer. Working on these critical steps will make sure you don't give up any of your "lost" positions without putting up a real fight and make it extremely difficult for your opponent to convert their advantage. 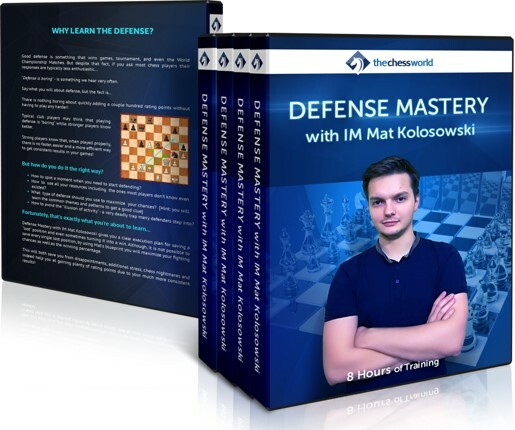 Defense Mastery with IM Mat Kolosowski gives you a clear execution plan for saving a lost position and sometimes even turning it into a win. It took IM Kolosowski a decade to develop and polish this system. All the defensive strategies, execution plans, and winning ideas are TESTED and PROVEN to be effective against the competition of any level by IM Kolosowski and his numerous students, coaches, and peers. Although it is not possible to save every lost position, by using Mat's blueprint you will maximize your fighting chance as well as boost your winning percentage. This will save you from disappointment, additional stress, and chess nightmares. Of course, it will also help you gain plenty of rating points due to your much more consistent results! If you ever wanted to learn how to play a world-class defense and start saving and winning your LOST positions subconsciously on an AUTOPILOT here is your real chance! Are you ready to take you Defensive Skills to the Master territory and beyond? Let’s get started! In this 16-lesson, 8-hour course IM Mat Kolosowki provides you with the full arsenal of all the necessary tools and ideas to make sure you can defend your positions against much tougher opponents! By applying Mat's execution plan and his thinking models you'll be able to save and even win many of your "lost" games! 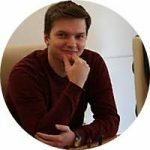 Watch IM Kolosowski outplaying his competition with the Defensive ideas, principles, and plans demonstrated in the course. This extra video will help you see how everything works together! Advanced training tasks taken directly from the video course's games. Learn from the ideas and strategies of the strongest players. After solving those problems you will get one step closer to defense mastery! Instant download of the 3 hour long, video course with IM Valeri Lilov. 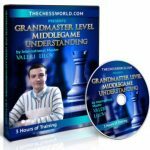 This video covers some of the most important middlegame positions and shows how they should be played to get an edge. Only available to the first 50 buyers. If you already have those courses, you can replace it with a comparable value course.